The prospects are terrifying. A vision void of comprehension. Yet there was a time when Oklahoma's Adrian Peterson and Heisman Trophy winner Reggie Bush nearly ended up in the same backfield at USC. "It came down to the last day," Peterson said. "It was really tough." It's an image that borders on harrowing and leans toward ludicrous. Enough speed and swivel to stuff the Christmas stocking of every boy and girl from Bangor to Baja. Alas, Bush found a running mate in LenDale White and Oklahoma got the pride of Palestine, Texas, a 6-foot-2, 218-pound package of mercury and might who is only now hitting his stride as the Sooners prepare to meet No. 5 Oregon in next week's Pacific Life Holiday Bowl. Slowed by a bum ankle that largely left him moored on the margins of mediocrity for a sizable portion of the season, last year's Heisman Trophy runner-up – the highest finish ever by a freshman – flashed ample evidence of his return to form in a rout of Oklahoma State late last month. In what is aptly dubbed the "Bedlam Series," Peterson turned Memorial Stadium in Norman into a madhouse, saddling the Cowboys with a 42-14 loss in a game in which he rushed for a season-high 237 yards, scoring on touchdown runs of 84 and 71 yards. "We were making headway until he took over," said OSU coach Mike Gundy. Before breaking out against the Cowboys, Peterson had endured a three-game span in which he rushed for only four total yards. After spraining his ankle in a season-opening loss to Mountain West Conference champion TCU, a stumble that initiated Oklahoma's free fall from the Top 25, Peterson suffered a more severe version of the injury against Kansas State. With Peterson on the shelf (he missed all or more than half of four games), the Sooners went stale, ultimately losing to UCLA, Texas and Texas Tech in three games in which the sophomore tailback averaged 58.6 yards. A year ago, in becoming the first OU player to earn All-America honors as a freshman, Peterson averaged 148.1 yards per game. "It was really frustrating, especially being a guy who always wants to compete," said Peterson, who finished with a flourish to average 102.4 yards a game. "Not being able to be out there helping my teammates, it was killing me." It didn't exactly do wonders for the Sooners, either. A program accustomed to prancing among the ranks of college football's well-heeled, Oklahoma lost three of its first five. With the Sooners already thin in terms of experience, injuries took their toll in other areas as well. With its players combining to miss 36 full games to injury this season, OU, which has been in three national title games in five years, also lost leading receiver Travis Wilson (foot) for the season and was forced to play 12 true freshmen. Nonetheless, the Sooners (7-4) regrouped to win five of their last six and Peterson played on, rushing for more yards than any running back in the Big 12. His 1,024 rushing yards ranked second in the conference to Missouri quarterback Brad Smith. "This is a guy who, when he's healthy, has been phenomenal," said Oklahoma coach Bob Stoops. "Once he regained the strength in his ankle this year, he was right back to running with power and making the same kind of cuts before he was injured. He really came on once he was over the injury and he has been sensational in every game since." It's unlikely that anyone is more delighted with Peterson's resurgence than Sooners quarterback Rhett Bomar. 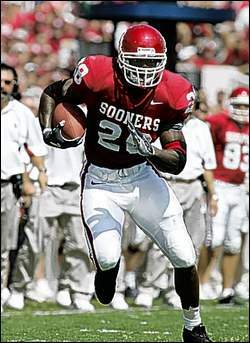 A redshirt freshman, Bomar has merely been called upon to fill the shoes left by Josh Heupel, who led the Sooners to a national championship in 2000, and Jason White, who won the Heisman Trophy in 2003. "It helps out a lot," Bomar said. "He's a great player and everybody knows that. It takes a lot of pressure off me. I always say a quarterback's best friend is a great running back. When people key on him or stack the line of scrimmage, that only opens up lanes in the passing game. And in the second half of the season, we've really been able to take advantage of that. "It's been great having him back. I don't have any doubt that (Peterson) is comparable to where he was as a freshman. I think he's shown in the last four or five games that he's healthy now." And, apparently, a tad hungry. Peterson, who needs just 51 yards in the Holiday Bowl to reach the 3,000-yard mark, has rushed for more than 100 in four straight games. Despite having played in only 10 games this year, while also having undergone shoulder surgery in the offseason, he has 15 touchdowns, one more than he scored in 13 contests last season. "I'm getting there; I'm almost back to 100 percent," Peterson said. "I've always been a player who is going to set my goals high and I'm going to keep reaching for them whether I fall short or not. "Injuries happen, it's just a matter of how you handle them. It's like a light switch. You can either turn it off or turn it on." And, in the case of Oregon, pray for a blackout.